Generations No. 1 and No. 2 are in dispute so they have been removed until source documents can be found. 3. THOMAS WOOD (WILLIAM, NICHOLAS) was born 6, April 1653. He married MARY BOWYER 02 May 1682 in Brighton, Sussex, England. Child of THOMAS WOOD and MARY BOWYER is: William Wood, b. Abt. 1694, Buxted, Sussex, England. 4. WILLIAM WOOD (THOMAS, WILLIAM, NICHOLAS) was born Abt. 20 May 1692 in Buxted, Sussex, England. He married MARY HOPE 29 September 1719 in Buxted, Sussex. Child of WILLIAM WOOD and MARY HOPE is: Thomas Wood. 5. THOMAS WOOD (WILLIAM, THOMAS, WILLIAM, NICHOLAS) He married ANN BANNISTER 16 April 1745 in Mayfield, East Sussex. Child of THOMAS WOOD and ANN BANNISTER is: Thomas Wood. 6. THOMAS WOOD (THOMAS, WILLIAM, THOMAS, WILLIAM, NICHOLAS) He married SARAH SKYNNE 02 February 1780 in Buxted, Sussex. Child of THOMAS WOOD and SARAH SKYNNE is: Samuel Wood, b. Bet. 1782 - 1788, Buxted , Sussex, England; d. 16 March 1865, Ditchling workhouse. workhouse. He married ELIZABETH EVEREST 29 June 1817 in St. Michaels, Withyham,Sussex, England, daughter of JOHN EVEREST and HANNAH WARD. She was born Bet. 1796 - 18 August 1799 in Parish of Withyham or Willingham, Co. of Sussex, England, and died Bef. 1861. Researcher John Oliphant found a Samuel Wood, age 82 who died in the Ditchling workhouse 12/21/1865. John believes this to be our Samuel as the age would be correct and no other death record was found. turned up no Samuel Wood family members. The name " Wood " is derived from the Old English word; wudu, meaning wood. The name was given to those who worked with wood or lived near woods. 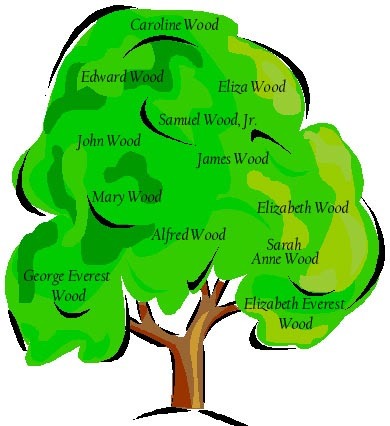 Wood Family History, published in 1973 by the American Genealogical Research Institute. Per 1840 tithe award, Samuel and Elizabeth resided Delves Estate and garden # 417. This was a cir 1800 brick two-bed cottage called Chamberlaines, standing on its own in a field north of Ashton Green. Per the 1861 census, Samuel was living in the Ditchling Workhouse and a widower so Elizabeth died prior to 1861.
i. Elizabeth Everest Wood, b. 1819, Parish of Withyham, Co. of Sussex, England. ii. Mary Wood, b. 1820, Ringmer, Sussex, England. iii. Samuel Wood, Jr., b. Bef. 1824, Withyham, Sussex, England. iv. Sarah Anne Wood, b. 1824, Ringmer, Sussex, England; m. George Briggs. v. Edward Wood, b. 1826, Ringmer, Sussex, England. vi. John Wood, b. Bef. 20 August 1826, Parish of Withyham, Co. of Sussex, England. vii. Caroline Wood, b. 1830, Ringmer, Sussex, England. viii. Eliza Wood, b. Bef. 13 May 1832, Ringmer, Sussex, England. ix. Alfred Wood, b. 1834, Ringmer, Sussex, England. xi. George Everest Wood, b. 22 December 1839, Ringmer or Rinchers, Sussex, England; d. 23 July 1924, Hillsdale Co. Mich.
1801 in Framfield or Jeantfield, East Sussex, England. i. Elizabeth Beckett Wood, b. 1841, Ringmer, Sussex, England. ii. Samuel Bristow, b. 1848, Brighton, East Sussex, England. iii. William Bristow, b. 1850, Brighton, East Sussex, England; m. Emma ? ; b. London Marylebone. 9. ALFRED WOOD (SAMUEL, THOMAS, THOMAS, WILLIAM, THOMAS, WILLIAM, NICHOLAS) was born 1834 in Ringmer, Sussex, England. He married ANN GILLMON 24 December 1855 in St. Nicholes Church, Brighton, Sussex, England. She was born 1835 in Handover, Hampshire, England. i. Isaac Wood, b. Abt. 1863, Portsmouth, Hampshire, England. MARY PENROD 02 November 1910, daughter of ISAAC PENROD and NANCY MIZER. She was born 01 December 1843 in Ragersville, Ohio, and died 27 October 1916 in New Philadelphia, Ohio. See the 1880 Ohio,Tusc Co. ,Goshen Twp. census for children info. Victoria, Elizabeth and Richard, along with husband James, age 30.
i. Jane I. Wood, b. 1876, Ohio; d. 1929, Hillsdale Co. Mich.
ii. George Emerson Wood, b. 07 March 1877, New Philadelphia, Ohio; d. 02 November 1918, Niles, Trumbull Co., Ohio. iii. A. Ellen Wood, b. 07 October 1879, Furnaceville, Salem Twp.,Tuscarawas Co., Ohio; m. L. Kaufman. 11. SAMUEL BRISTOW (MARY WOOD, SAMUEL, THOMAS, THOMAS, WILLIAM, THOMAS, WILLIAM, NICHOLAS) was born 1848 in Brighton, East Sussex, England. He married LUCY EDWARDS 1867 in Brighton, East Sussex, England. i. Samuel Bristow, b. 1870, Winchester, Hampshire, England. ii. William Bristow, b. 1882, Buxted, Sussex, England. iii. George Bristow, b. 1886, Buxted, Sussex, England. 12. JANE I. WOOD (GEORGE EVEREST, SAMUEL, THOMAS, THOMAS, WILLIAM, THOMAS, WILLIAM, NICHOLAS) was born 1876 in Ohio, and died 1929 in Hillsdale Co. Mich. She married (1) ? BROWN. She married (2) DANIEL KAUFMAN. He was born 1875 in Ohio, and died 1949 in West Woodbridge Cemetery, Hillsdale Co., Michigan. i. Ruby M. Brown, b. Abt. 1900.
ii. William N. Brown, b. Abt. 1901, Ohio. 13. GEORGE EMERSON WOOD (GEORGE EVEREST, SAMUEL, THOMAS, THOMAS, WILLIAM,THOMAS, WILLIAM, NICHOLAS) was born 07 March 1877 in New Philadelphia, Ohio, and died 02 November 1918 in Niles, Trumbull Co., Ohio. He married ANNA MAY GREEN 10 November 1897 in Cert # 22427, doc. 9/10 1888-1899 tape/5, daughter of JOHN GREEN and JANE CHRISMAN. She was born 15 May 1877 in Uhrichsville, Ohio, and died 21 November 1955 in Allen Lane Rest Home,. Medical Information: Was ill just three weeks. He was one of 20 million plus who died from the Influenza outbreak. Resided: 1917, Goshen Twp., New Philadelphia, Oh. Funeral: 25 November 1955, New Philadelphia, Oh. i. Minnie B. Wood, b. 24 December 1894, New Philadelphia, Tuscarawas Co., Ohio; d. 11 January 1945.
ii. Mary Jane Wood, b. 30 October 1898, New Philadelphia,Ohio. iii. Clifford George Wood, b. 03 February 1900, New Philadelphia,Ohio; d. 31 December 1963, Parma, Ohio. iv. Oliver Harry Wood, b. 19 June 1905, New Philadelphia, Ohio; d. 20 August 1961, New Philadelphia, Ohio. v. Richard Sylvester Wood, b. 22 March 1908, New Philadelphia, Ohio; d. 02 July 1978; m. (1) Elsie Anderson; m. (2) ? ; m. (3) Elizabeth E. Goss; b. 16 May 1908, Guernsey Co., Ohio; d. 21 September 1976. Funeral: 07 July 1978, New Philadelphia, Oh. Occupation: 23 November 1936, The Reeves Mfg. Co. Dover, Oh. Resided: Dover, Oh. Elsie married three times. She first married Pappy Cramer, then Richard. Her third husbands name is unknown. vi. Russell Emerson Wood, b. 03 August 1902; d. 18 March 1985, Doctors Hospital, Massillon Ohio. 14. WILLIAM N. BROWN (JANE I. WOOD, GEORGE EVEREST, SAMUEL, THOMAS, THOMAS,WILLIAM, THOMAS, WILLIAM, NICHOLAS) was born Abt. 1901 in Ohio. He married CLARA S. ?. She was born in Michigan. i. Donald E. Brown, b. Abt. 1926, Ohio. 15. MINNIE B.WOOD (GEORGE EMERSON, GEORGE EVEREST, SAMUEL, THOMAS, THOMAS, WILLIAM, THOMAS, WILLIAM, NICHOLAS) was born 24 December 1894 in New Philadelphia, Tuscarawas Co., Ohio, and died 11 January 1945. She married HAROLD D.
GORDON 28 March 1914, son of JEROME GORDON and HARRIET KURTZ. He was born 07 November 1893 in Franklin Twp., Tuscarawas Co., Ohio, and died 30 August 1952. Since the original spelling of this old family name was deGordon, undoubtedly the family came from France during the time of the Norman invasion in 1066. The name was derived from the Scottish word meaning a wedge shaped hill. One of the most prominent members of this family was Richard deGordon who attained many distinctions during the reigns of King Malcolm the Fourth and King William the Lion. One of the earliest settlers bearing the Gordon name was James Gordon who made his home in Kent County, Delaware where he died in 1740.
they raised five children: Elizabeth who married John Kenton; Mary Ann who never married and who inherited the farm for taking care of her parents in old age; James Jr.
who married Jane Bowen; George and Hannah who married Daniel Clark. All lived and died in Bedford County. James Sr. died between July 21, 1818 and July 31, 1818. No death record has been found for his wife Ellenor but by using the census it appears she died between 1830 and 1840.
leaving Jane with five children to raise: Elizabeth who married John Smith; Martha who married John W. Hammer; a daughter who died before 1821; Jane who married twice. The second marriage was to Thomas Griffith. She died in 1840; the last child being Jeremiah. Our direct line continues with Jeremiah, who was born July 9, 1811. He married Jane Smith, daughter of Quaker parents Thomas Smith and Pheobe White, on March 31, 1836. Jeremiah was a carpenter who fought in the Civil War and spent his entire life in Bedford County. Jeremiah died on September 13, 1881 and Jane died on November 15, 1895. 1851; Lorenzo Madden born October 30, 1853. He married Margaret Adams. James and his bride returned to Bedford County to become head of the Gordon household. James and Anna had their first child on August 20, 1862, Elias Ellsworth Gordon. died October 25, 1922 . James and Anna are buried in Bunker Hill Cemetery in Winfield, Tuscarawas County, Ohio. i. Eunice Mardel11 Gordon, b. 08 November 1916; d. 02 February 1991.
ii. Thalia Mae Gordon, b. 03 February 1918; d. 19 January 1990. 16. MARY JANE WOOD (GEORGE EMERSON, GEORGE EVEREST, SAMUEL, THOMAS, THOMAS, WILLIAM, THOMAS, WILLIAM, NICHOLAS) was born 30 October 1898 in New Philadelphia,Ohio. She married GEORGE BURNETT 27 December 1918. He was born in Ohio, and died February 1978 in Phoenix, Arizona. George and Mary had two children, both boys. Late in life George and boys relocated to Arizona. Margaret Angus stated that George had changed the spelling of his name and that Mary had died young while living in the Cleveland area. ELIZABETH MCGOWAN Bef. 1922. She was born 22 May 1903. He married (2) EVELYN FERROLL FORSEBERG 14 November 1925 in pos. Niles, Trumbull Co., Ohio, daughter of JOHN FORSBERG and ALMA ?. She was born 15 January 1904 in Cane, Pennsylvania, and died 05 January 1992. Resided: 21 July 1952, 6851 Oakwood Dr. Parma Hgts., Oh. i. George Edgar Wood, b. 25 December 1922; d. 01 May 2002, Ravenna Community Hospital. ii. Gloria11 Wood, b. 10 September 1926.
iii. Phyllis Wood, b. 22 May 1928.
iv. Eileen Wood, b. 29 November 1929. Tuscarawas Co. Ohio, and died 07 August 1961 in New Philadelphia, Ohio. i. Margaret May11 Wood, b. 03 September 1924.
b. 14 June 1927, Dover, Ohio; d. 06 November 2003, Dover, Ohio; m. Jeannette Lillian Stephens, 19 May 1951, New Philadelphia, Ohio; b. 23 February 1929, Amsterdam, Ohio. Robert served 16mths in the Navy on the U. S. Midway. His job was attending the anchor. Notes for Jeannette Lillian Stephens: Adeline, Jeannette's mother, went to a neighbor and requested a Doctor be summonsed as she was in labor. The neighbor telephoned a Doctor, who asked if Adeline was in "Hard Labor". The neighbor indicated "No" so the Doctor took his time getting to the house. In fact, the Doctor went rabbit hunting on his way out to the house. By the time he arrived Jeannette had already been delivered. Not only did the good Doctor fail to make the birth, he, according to Jeanette, he provided the Department of Health with the wrong name. The doctor gave the Health Department the name - Janet Lillian Stevens and listed her fathers name as Herman N. Stevens (note the spelling of his last name). So her birth certificate indicated one name and Jeannette has gone by another name all her life. In 1932 Jeannette became the 54th reported case of Polio in Tuscarawas Co. Ohio, only the 10th in New Philadelphia. November 1946, Greenup, Kentucky; b. 06 August 1921, Dover, Ohio; d. 29 March 1968, Dover, Ohio. Debbie Elaine Belknap, 04 May 1987; b. 25 February 1953. 19. RUSSELL EMERSON WOOD (GEORGE EMERSON, GEORGE EVEREST, SAMUEL, THOMAS,THOMAS, WILLIAM, THOMAS, WILLIAM, NICHOLAS) was born 03 August 1902, and died 18 March 1985 in Doctors Hospital, Massillon Ohio. He married (1) FRIEDA ? Aft. 1918. He met (2) CATHERINE CHRISTINE WEBER 1942. He married (3) ADA MALTERER Bef. 1954. She was born 1911, and died 06 October 1957. He married (4) LILITH LEORA JERVIS between 1954 - 1956, daughter of FRANK JERVIS and MYRTLE LOVE. She was born 20 January 1913 in Follansbee, West Virginia, and died 24 October 1996 in Columbia Mercy Medical Center, Canton Ohio. Russell married three times. His first wife was Frieda, his second wife was Ada Malterer and his third wife was Lilith. Resided: 1985, 2422 Daleford Ave Canton, Oh. Notes for FRIEDA ? : Frieda was Russell's first wife. Notes for ADA MALTERER: Ada was Russell's second wife. She had previously been married and had one child,Charles. Notes for LILITH LEORA JERVIS: Lilith was Russell's third wife. When they married she already had four grown children. i. Glenna Mae Wood, m. ? Forester. ii. John Joseph11 Weber, b. 1942, Unwed Mothers Home, Cleveland, Ohio; m. Ann ?.